In 2016 I became a canon of Bishop Aglionby Cathedral in Tamale, Northern Region in Ghana, and in January it was a great pleasure and privilege to return to Tamale Diocese for the ordination of six people as priests. I left the cold and wet Cotswolds for 30 degrees of warm, dry sunshine. 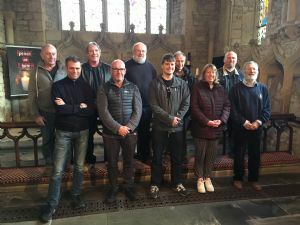 Over the last three years the diocesan clergy have grown in number and there has been significant growth in the number of Anglican worshipping communities. Most clergy now have one parish church with half a dozen ‘outstations’ holding midweek or Sunday services, many led by lay Catechists. 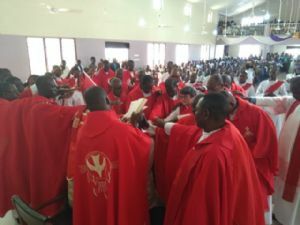 The Ordination Service was held in Upper East, an hour from the nearest tarmaced road. Despite the challenges of getting to the church, which has only been open for two years, there was a congregation of over 1,000 people. The service lasted for six hours with lots of singing and dancing, and I thoroughly enjoyed preaching. In my time off, I went to see crocodiles, elephants, gazelles and ‘bush pigs’ or warthogs. The markets and outdoor stalls were full of vibrant life, colour and smells, and white people are still a novelty so far north. Children especially would stoke my arms to check whether the colour was real! 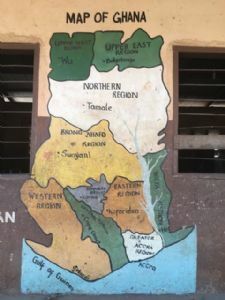 I also spent a morning at Tishigu School next door to the Cathedral in Tamale. 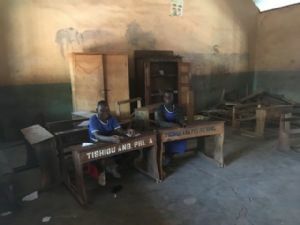 Promised government funding has not arrived, and the infrastructure of the school is now in very poor repair, with cracked and pitted concrete floors and a paucity of desks. I hope that through Lent this year it will be possible to raise money from our church and community for desks. 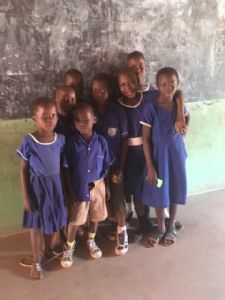 At the moment, the youngest primary classes are taught with both children and teachers sitting on the floor. A metal-framed double desk costs only £30, and will last for many years. Posters and the website will be advertising a specific fundraising event for the school which will take place on Friday, 15th March. A packed church witnessed Doreen Robinson, our Choir Master, being admitted to the Company of St Kyneburga in recognition of their long service to the church in the Diocese of Gloucester. 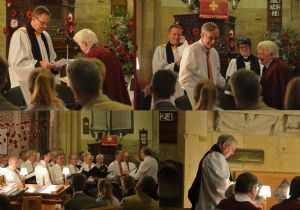 During the Festal Evensong in her honour, with both the full church choir and the Blockley Blokes Choir, Phil Archdeacon Phil told the congregation of the historic origin of the Order and of the many years of service Doreen has given to the music at both of our benefice churches. A round of rousing applause followed the medallion of the Order being given to her. All present enjoyed the splendid wine and refreshments that followed. 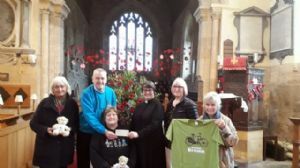 When the BBC brought Father Brown to Blockley, local resident Steve Kyte decided to set up the Brownees fan club and through social media sell Father Brown related memorabilia to raise funds for good causes. One recent recipient has been Blockley church, Father Brown's St Marys. The Brownees have donated funds to purchase a wooden pedestal to display the wonderful creations of our flower arrangers. This will replace one of the old metal stands which has rusted away. A big thank you to the Brownees - especially as they are keen to replace more stands! Filming for the new series of Father Brown commences in early May. Good news! Dana's call for new blood to come forward and take over the production of CVN has resulted in the creation of an exciting new editorial and design team. As well as a new design and format there is a new title too - The Voice, which will make its debut in May. The ancient timbers of our old bell frame have finally found a new home, and our peal of ten bells has rung a full memorial peal lasting 3 hours and 18 minutes! 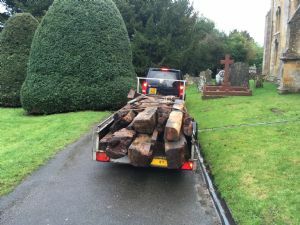 Having been resting in the churchyard for the past year, permission was finally received to dispose of the remains of the 1727 wooden bell frame. 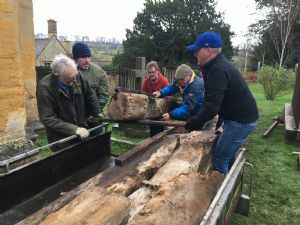 Simon from Sheffield heard that the timbers were available and travelled to pick them up for re-use in the restoration of his old farmhouse. A team of strong helpers assisted with the loading and to see them safely on their way. In return for the timbers and the assistance given, Simon made a very generous contribution to church funds. To celebrate the anniversary of Samuel Scattergood - one of Blockley's kindliest vicars - death in 1691, a team of highly respected bell ringers from around the country assembled in the tower to ring a memorial full peal . The bells rang out over the village with the peal taking 3 hours and 18 minutes to complete. After, the ringers commented most favourably on the quality and sound of our re-hung original eight, and the two new bells! Click here to read more about Samuel Scattergood. 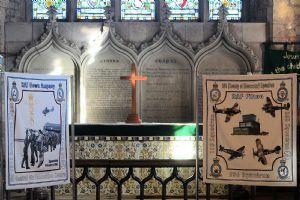 An exhibition of tapestries created in celebration of 100 years of the RAF was held in the church for three days from 19th October. A preview was held on the Friday evening, with wine and canapes and entertainment from the Blockley Blokes choir. The tapestries were the brainchild of Ray Bunston, who in 2016 got together with Pat Coupe and Chris Bazeley and between them they created the design for each panel which were brought to life by a team of needle workers eager to bring the project to fruition. The exhibition was very well attended and over the course of the weekend many visitors were overwhelmed by the intricacy of the designs, the quality of the stitching, and the subtle use of colour. The 10 incredible tapestries that were on show will be joined to form one large piece of work which is to be put on permanent display at the Jet Age Museum at Staverton. 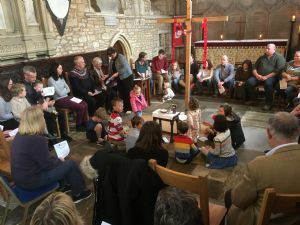 Our church in Blockley is growing, and with growth comes opportunity and challenge. As a result Junior Church has been introduced on the 3rd Sunday of each month, and is led by our Team Youth Worker, Amy Todd. The new Second Sunday@Six , is a service for those looking for something different. Candles reflection , prayer and music, and a quiet space to meet with God. Do join us. Meanwhile Open Door, our informal all age service on the first Sunday of the month continues to grow. Maybe its the bacon sandwiches? For more information please contact Ginny Williams-Ellis (01386 700883) or Marie Hildreth (01386 700472). To raise funds for the upkeep of the church some very attractive Father Brown collectables have been created using original artwork by our very own Barbara Dunn. A fine bone china mug, a greeting card, a jute shopping bag, and a linen tea towel are on sale at Blockley Shop.